"If you are sure you understand everything that is going on in healthcare information technology, you are hopelessly confused." In some countries men can buy dapoxetine at their local pharmacies and use it. Sometimes it is sold over the counter without a prescription, or sometimes a prescription is required. For ten Advocate hospitals, Flying Aces maintains all technical aspects of Advocate Physician Partners' Electronic Referral Management Application (ERMA). Deployed in 3,000+ physician offices, ERMA allows office staff to submit referrals via a web interface for capitated patients. The electonic referral is processed through a configurable set of business rules which either automatically approves the referral or routes it to back-office staff for manual review. ERMA was awarded 2nd Place for "Technology for the Improvement of Administrative Efficiency" at the Emerging Technologies and Healthcare Congress. Flying Aces led the development of the Genesis laboratory web portal linking physician offices with this regional reference laboratory. 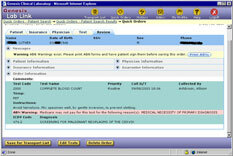 The portal provided physicians secure online access to clinical orders and results. Using a browser and an Internet connection, physicians could look up patient demographic information, create lab orders, query order status and review the results with the click of a mouse. 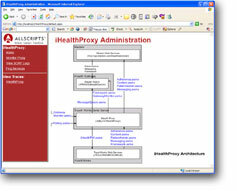 On the backend, the lab portal linked to the laboratory's LIS and billing systems using HL7 through OPENLink. Motivated to encourage tranparency in the U.S. health care system, Flying Aces developed a search engine to catalog prices for common health care services, OutofPocket.com. 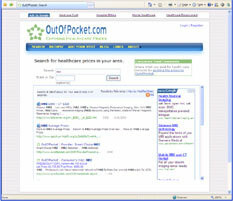 The custom search engine to allow consumers to comparison shop for common healthcare services. Using Microsoft's Search Server, the search engine crawls multiple sources of pricing data: government databases, healthcare care provider websites and pricing data collected from consumers. Allscripts, an electronic medical records (EMR) software vendor, and Medem, a physician-patient portal application service provider, announced ambitious plans to integrate their products, but after several false starts had made little progress. The EMR vendor then brought Flying Aces in to kick-start the software engineering effort. Flying Aces met with the portal vendor and developed technology prototypes to flesh out the technology and integration issues. Over the next months we led the development of the gateway and served as the liaison between the EMR and portal development teams. The gateway used Web Services, WS-Security and PKI to send registration, scheduling, prescription and patient education transactions between the physician's local EMR system and the patient's web-based portal. The gateway featured sophisticated diagnostic and monitoring instrumentation to enable technical support and problem diagnosis. Using the industry standard messaging protocol HL7, Flying Aces has deployed numerous application interfaces integrating the disparate applications within hospitals. Typical deployments include a web-based physician portal allowing physicians a single consolidated view of the patient's clinical information. Noteworthy Medical Systems / Netsteps, Inc. Working with solution vendor Netsteps Inc., Flying Aces developed a SOAP interface linking Netsteps' healthcare repository product with Noteworthy Medical Systems' practice management software. 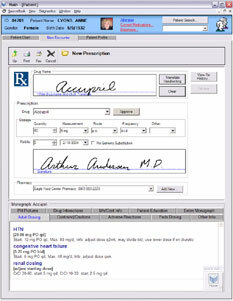 Designed to allow Noteworthy's product to participate directly with hospital information systems, the SOAP API supported ADT, lab results and order entry. Based on an investor's vision and a 10-page business plan, developed first version of a comprehensive software application addressing the needs of small medical practices. Targeted for the Tablet PC platform, the product leveraged the tablet's wireless networking, lightweight form factor, pen-input, and handwriting recognition. Features included electronic prescription order entry (CPOE), lab order entry, encounter forms, medical records and back office links to 3rd party billing services. Flying Aces represented the company in meetings with customers and investors. Marketing efforts included developing the company website, marketing presentations, and CD-based sales demos. BD is a multi-billion dollar medical technology company serving healthcare institutions, life science researchers, and clinical laboratories. As part of a national launch of their safety-engineered injection products, BD needed a product conversion tool to assist BD sales consultants in cross-referencing and standardizing a customer to BD's new product-line. Flying Aces developed an Excel-based application that used a wizard-style interface to step the sales consultant through the process of specifying the customer's current usage of hypodermic products, and converting that usage to a new purchasing plan based on BD's safety products. The customer was then supplied with reports detailing product standardization, sku summary and cost analysis. 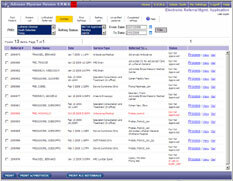 Eventually, Flying Aces produced multiple releases of the sales tool for three different product lines. Feedback from the field was very positive -- an unusual response for a sales tool.